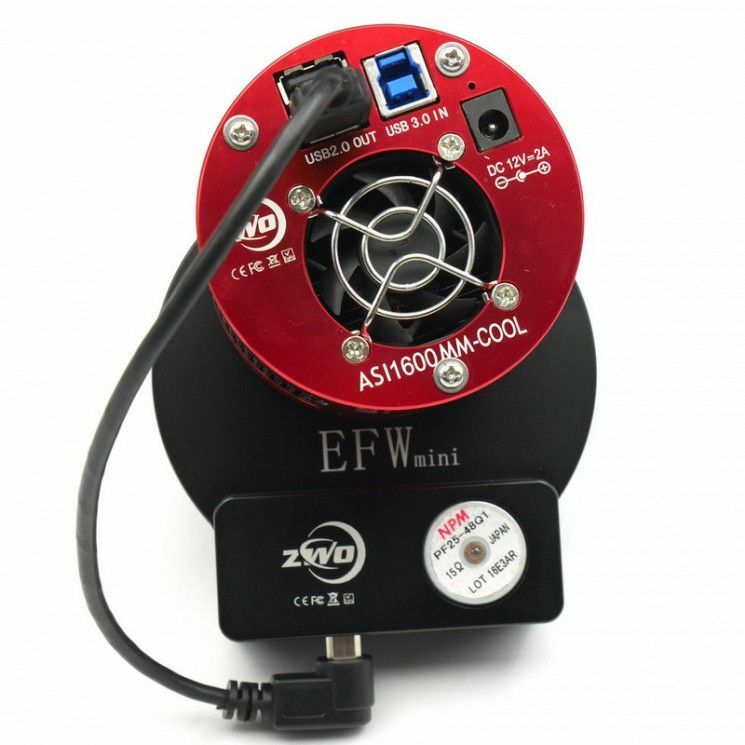 See and buy ZWO EFWmini 5-position Filter Wheel for 1.25" and 31mm Unmounted Filters at our Hertfordshire UK Showroom or buy online with Free UK Delivery. 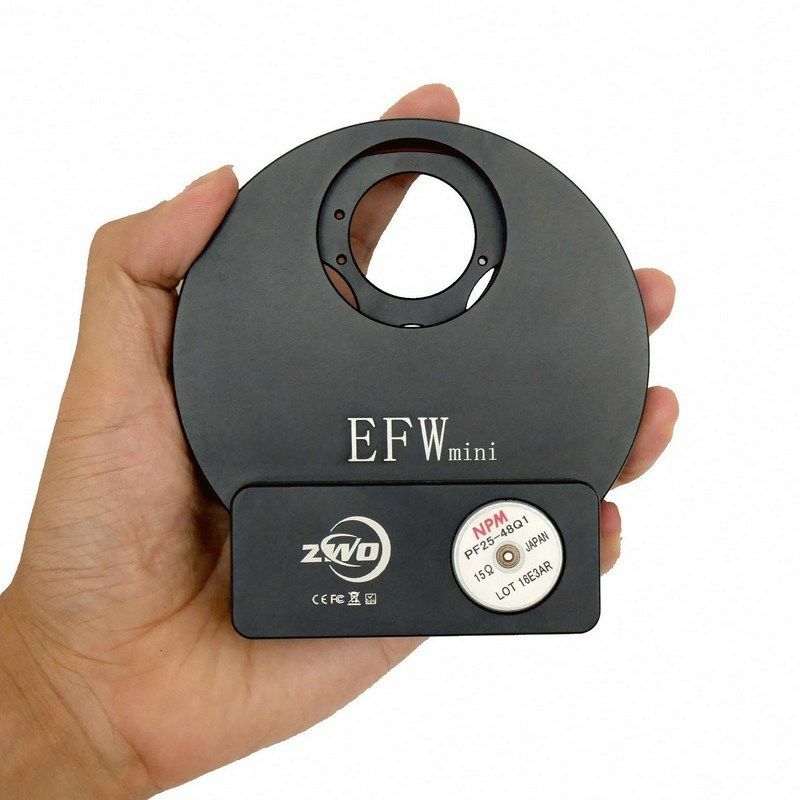 The latest news from ZWO, this electronic filter wheel is certainly one of the smallest 5-position filter wheels in the world. it is also extremely lightweight, it weighs 300g only. Its housing is CNC machined from aircraft grade aluminium alloy. The stepper motor, that is the heart of any electronic filter wheel, is made by a reliable Japanese company, NPM. You can trust its quality and reliability. 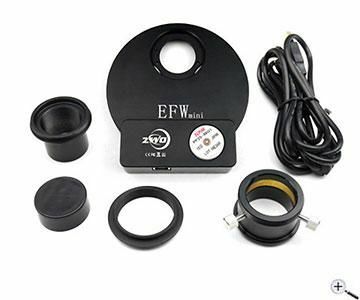 This high quality 5-position filter wheel has been designed mainly for astro photography, especially, but not exclusively for ZWO ASI1600 cameras. As it is ASCOM compatible, it can be used with other cameras as well. 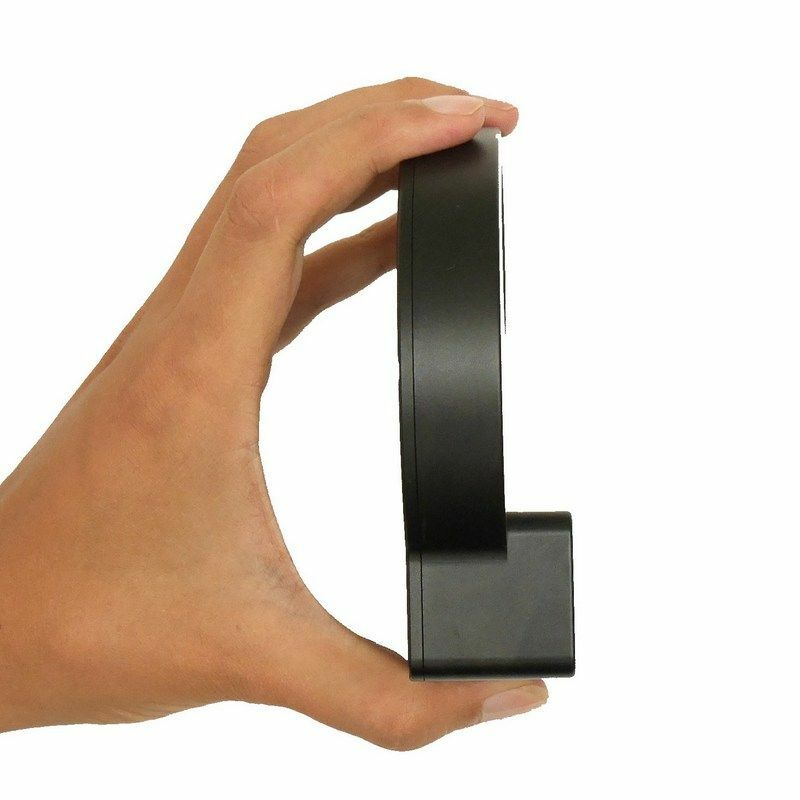 Up to five filters can be installed in the numbered compartments that feature standard 1.25" filter thread or you can also install 31mm unmounted filters (or semi-mounted Astronomik filters), and each can be selected for your eyepiece or camera from an imaging software. Although ZWO only offers 1.25" filters at the moment, 31mm filters will be also available soon. The filter wheel can be attached to your focuser either by the supplied 1.25” nosepiece adaptor or via a T-thread. There is actually a female T-thread on both sides of the filter wheel. One compartment can be left empty for unfiltered viewing. The robustly constructed filter wheel is supplied with a 1.25” nosepiece and a 1.25” eyepiece holder with brass compression ring. Please note: your focuser will require 20mm of additional inward focusing distance from the normal focus position to compensate for the thickness of the filter wheel. The distance between the filter and sensor is around 10mm when you connect the ASI1600 to this EFW, so a 1.25″ filter won’t have vignetting with a scope with up to f/5 focal ratio and a 31mm filter won’t have vignetting up to a f/2 lens. ZWO's new RGBL filters are recommended to use with ASI1600 cameras, as these specially designed filters will offer nearly 1:1:1 RGB color balance.